As some of you may recall, I attended the opening of LEGO’s new London office a couple of months back (report here) along with Ambassadors from some of the other UK LUGs, members of the press, LEGO employees and business partners. At the conclusion of the opening ceremony, the Ambassadors got to spend a few minutes chatting with LEGO senior management and had the opportunity to ask a couple of questions. Taking a turn in the hot seat were LEGO Chief Operating Officer Bali Padda, Vice President for Marketing and Consumer Experiences Conny Kalcher, and Vice President and General Manager LEGO UK Fiona Wright. I’ve summarised some of the questions and answers that came out of the discussions below. It's brief, but I still felt it was worth sharing, not least because it addresses a few common questions and concerns. Thanks to Richard Selby for jogging my memory and filling in some of the gaps, and apologies that this summary has taken so long to appear. A: Having spoken with customers in these new markets, we heard that many of our existing lines have appeal there as well as in the West. That having been said, we haven't ruled out trying some I.P. with more local appeal. Q: Were the Minecraft minifigure sets always planned, or did they arise as a result of the success of Ideas/Cuusoo microbuild set? A: The Minecraft minifigure sets grew out of the success of Ideas/Cuusoo. A: This depends on a number of factors, not least how well a set sells, but it’s certainly possible. Q: What’s your view of AFOLs? A: They’re an important customer group and they helped the company to recover when it was in difficulty. Q: How do you react to concerns within the AFOL community regarding the ability to maintain traditional LEGO quality when using Chinese manufacturing plants? A: Chinese manufacturing plants will be owned and operated by LEGO and all workers will be LEGO employees - manufacturing will not be carried out via a third party contractor. This will help with job satisfaction, retention and ultimately quality. Plants there will be held to the same quality standards and tolerances as plants elsewhere. Q: Isn’t it true though that local regulations mean that LEGO can’t control all aspects of the process, e.g. the need to source ABS locally rather than use existing ‘trusted suppliers’? A: True, although there are also sound environmental reasons for sourcing locally, and we can also get product to market more quickly if it’s manufactured locally. A: Only with my children, and I’m terrible at free-building! [Fiona then asked if one of us could maybe teach her!] Neither I nor my husband had LEGO to play with when we were children so we’re making up for lost time! Q: A few years back there were a number of fruitful collaborations between LEGO UK and UK AFOLs, e.g. brand ribbon builds, store openings, events such as a London Science Museum build. These opportunities seem to have completely dried up now, however. 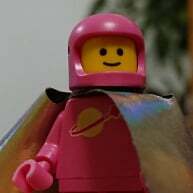 Is LEGO UK willing to work with AFOLs? Q: You produce some wonderful sets aimed at adults, e.g. modular buildings, Architecture, but we never see these advertised. Why? A: We would love to, but our advertising budget is limited and it's simply a question of priorities. The core market has to come first. Instead we use our PR agency to place stories in the press which generally keep the brand in the public eye. We are keen to associate our brand with the UK national identity, e.g. the Ascot / LEGO hat story, and the LEGO London Bus stop . Also we are thankful to David 'Taj Mahal' Beckham. We always invite him to our events, but so far he hasn't shown up! Thanks for this dr dave! Also we are thankful to David 'Taj Mahal' Beckham. We always invite him to our events, but so far he hasn't shown up! Some good questions - and equally good, open answers. Sounds like a good evening was had by all.